Back in May, Sony talked about expanding the PlayStation Network to cover other hardware devices. 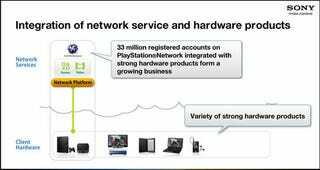 Today the company further details these plans, leveraging the PSN infrastructure to create an online service for all Sony hardware. The PlayStation Network has been a big hit with PlayStation 3 and PSP owners, and now Sony wants to bring the same experience to other areas of hardware, including televisions, MP3 players, ebook readers, and laptops. According to a Sony presentation delivered this morning, the same infrastructure that is used to deliver video and games to the PlayStation and PSP will be used to deliver games, video, music, and ebooks to other Sony devices. Consumers would connect to the Sony Online Service using a single user ID, meaning that most likely your PlayStation Network ID would also be your Sony Online Service ID as well. The network would also be used for devices like digital cameras, allowing users to share their photos and videos directly with the PlayStation 3, PSP, or newer Sony televisions without requiring the use of a computer or memory card. A unified service would further strengthen Sony as a brand, while giving users a unified interface familiar across all products. If they pull it off, it should be a real boon to the company, with hardware users knowing exactly what to expect when they purchase a Sony product.